Dean and I were first introduced to Mary Hamilton’s work when we went to Pittsburgh’s annual “A Fair in the Park” when we lived in Pittsburgh. Her artwork was on the poster advertising it and we picked up a free copy while there (it turns out she does the posters most years). That could have also been the year we bought a print — but since we were poor back then, I don’t know how we were able to afford it. 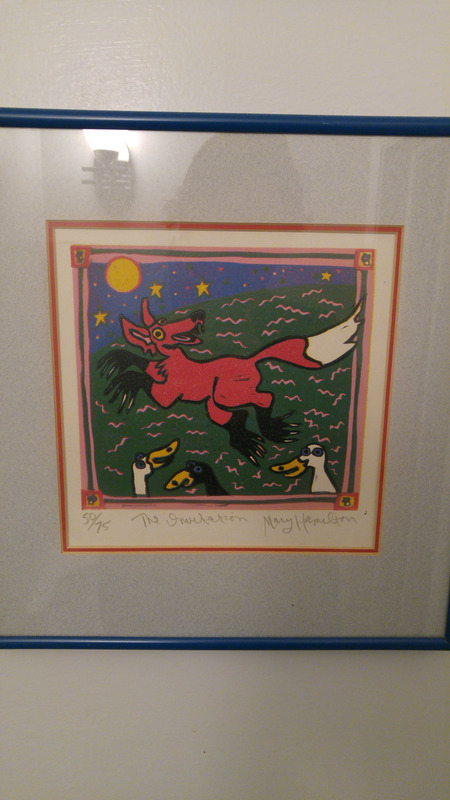 It is possible that once we were settled in Alexandria and had a little spare cash we went back to Pittsburgh and bought our Wolves Dining Out (Observed) print. That also must have been the year we bought the cat print for Neal and Marie. Anyway — we first heard of Mary Hamilton in Pittsburgh in 1984 and fell in love with her linocuts. Ms Hamilton’s work is whimsical, magical and colorful and it appealed to both Dean and me — which is very rare. We bought the Wolves, Dining Out (Observed) directly from her and she told us to make note that the wolves were eating peas and were very messy eaters. The year I was pregnant with Clare, and we were paying a visit to Neal and Marie in early summer, I wondered what we could bring them for a host/hostess gift. We both wished that we knew where to buy a Mary Hamilton print since they loved the cat print so much. I did a bold thing (for me — I hate talking to strangers on the telephone) and called the telephone number on a card that came with my Wolves Dining Out (Observed) print. The next thing I knew, I was talking to Mary Hamilton herself. She told me that the only place nearby that I could purchase her work was at P Street Gallery in Georgetown (now closed, alas). So I did another rare thing — I drove to Georgetown, parked the car and bought a framed print. This one was of two children in a tree. Marie loved it — maybe Neal did too, I don’t know. It is possible that Dean went to P Street Gallery with me at a later date and we bought our “The Invitation” print. Otherwise, I don’t know where it came from. Now we have this thing called the World Wide Web and I can find her work on Google Image search, Pinterest, Facebook, and elsewhere. Somewhere, perhaps at P Street Gallery, I bought a box of greeting cards with Ms Hamilton’s prints on them. I only gave them to very special people (or Dean since he could give it back to me if I wanted it) because I loved her artwork so much. I recently came across the 4 remaining cards and plan to get them framed either individually or as a quartet. Sometimes I think about showing off my art collection too. Lovely!